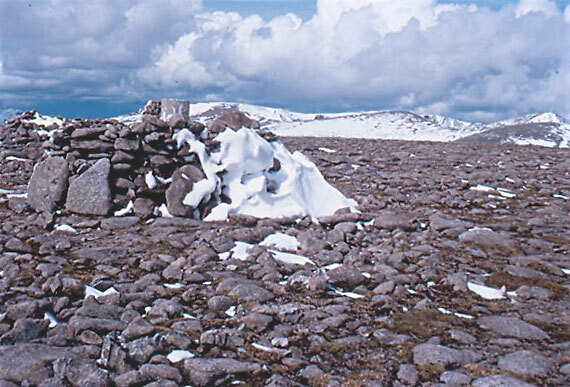 Beinn Bhrotain is a large complex mountain. Its N flank forms the steep craggy S wall of Glen Geusachan, and to the NE similar slopes overlook Glen Dee. 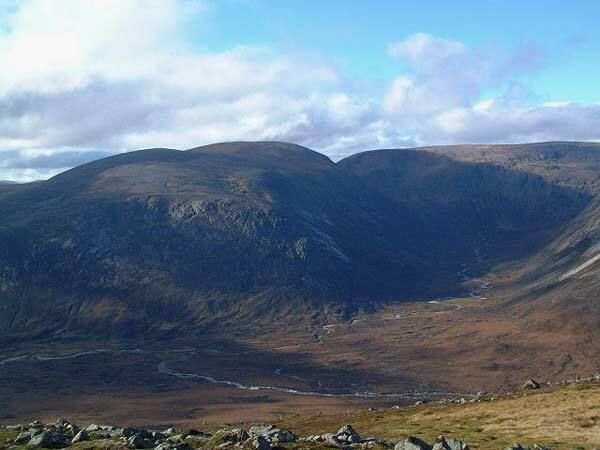 To the W and S there are moderate to gentle slopes over featureless moorland leading to Glen Feshie and Glen Geldie. 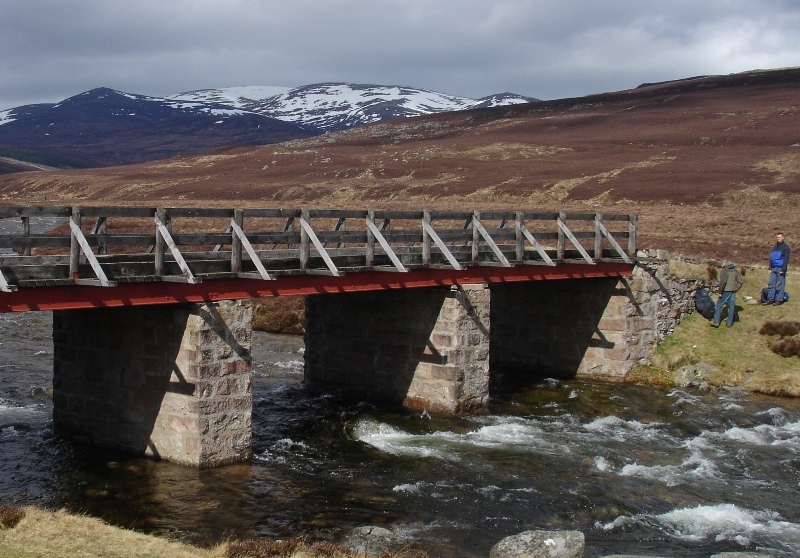 The normal ascent is from the SE where moderate slopes allow access from the Linn of Dee via White Bridge using the track through Glen Dee. 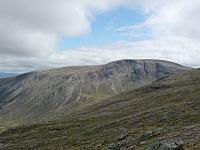 Beinn Brotain and Monadh Mor seen from Carn a'Mhaim. Beinn Bhrotain from the White Bridge on the Linn of Dee approach. 11th April 2009. The summary information of one or more ascent routes that include Beinn Bhrotain. 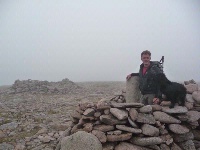 Post a few words about Beinn Bhrotain or read what others have had to say. Cycled from Linn of Dee car park to White Bridge which saved a good amount of time. Walked on and up to Loch nan Stuirteag through Glen Geusachanm which was fairly steady going but nicely rewarded with a fine, remote spot for a break. 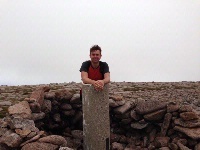 The summit of Monadh Mor was reached without difficulty and then up the bouldery North West edge of Beinn Bhrotian to the summit which was unfortunately covered in cloud. Descended down following the south side of the Alt Garbh missing the NEW PATH on the north side from about NN982914 to the Dee. 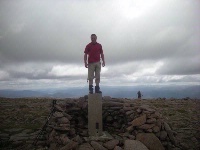 Very windy on the plateau but otherwise some lovely views towards Carn Toul/Ben Macdui etc. Definitely recommend taking the bike to shorten the duration of the 37km route. Use a bike to travel/from Linn of Dee. Oct 98 - I cycled in alone facing a gale - bottom gear all the way - very, very windy all day. First went over the deleted Munro summit before ascending the bulk of Beinn Bhrotain - red granite boulders and then onto Monadh Mor - both clouded. By then I was so buffeted and ground down by the wind I took a calculated gamble and desceded directly off summit of MM into Glen Gueshacan. 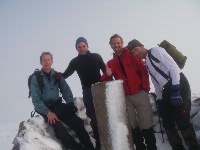 Luckily found a descent route but had to plough through deep snow and avoid large boulders and some greasy rock bands. Interesting walk back to bike through moraine humps.